SimaG Jewelry is an Etsy Shop based in Colorado, that offers hand stamped jewelry in both English and Hebrew. The jewelry is made from sterling silver, copper, gold, and gold-filled. SimaG Jewelry also has a blog, check out SimaG Jewelry Blog. 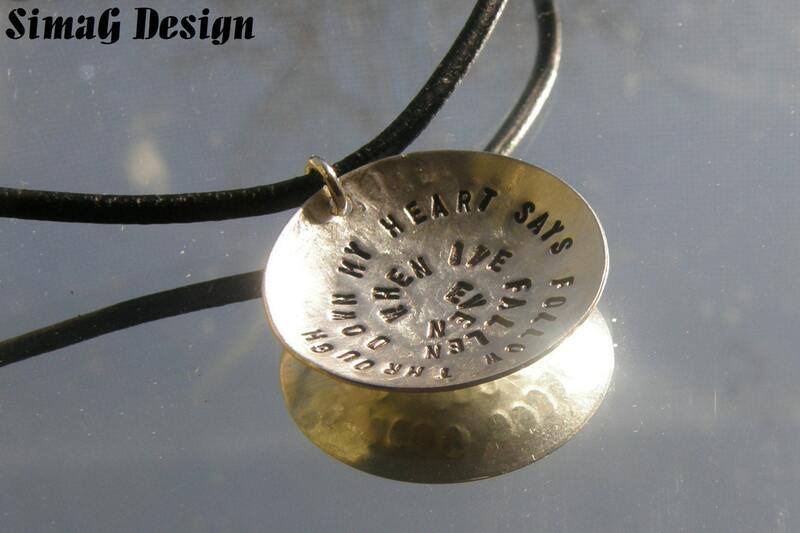 3) Winner can personalize disc pendant with names, dates, or a special saying. Leave the link to the item you would choose if it was up to you from SinaG Jewelry. Add my Father’s Day Fling Button to your blog or website. Visit 3 Garnets & 2 Sapphires and Follow all of her entries. I would chose the My Kids —-3– Handstamped Discs – One–Of- A- Kind Necklace (1/2 inch circles) on the 18″ chain. I would have GRANDMA, LEGEND, LENNOX put on the 3 dics. Father’s Day Fling button is on the right sidebar of my blog. My favorite is the one you are giving away! It is so unique – I love the bowl shape and the spiral writing! I follow Life Starring Ellie and Eve! I really like the necklace with “Don’t DREAM your LIFE , LIVE your DREAM” on it. http://www.etsy.com/view_listing.php?listing_id=24755241. I really like this design and the saying. Thanks for the wonderful giveaway. I would choose the For The Beautiful Lady Necklace. http://www.etsy.com/view_listing.php?listing_id=25463169. http://www.etsy.com/view_listing.php?listing_id=25463169. For some reason the link did not dhow up in my entry. I would choose the “Her Wings’. I would wear it to church and important events at my job. I would also wear it to spacial occasions! I love it’s simplicity! It would go with many things from my closet! Here’s the link, thanks for the chance!